This website will provide Source Water Protection Program (SWAP - formerly called Wellhead Protection Program - WHP) meeting minutes, Best Management Practices, links to other Wellhead Protection websites, educational outreach efforts and contact information. It is designed both as a resource to team members, and also to allow businesses, citizens, and students to become familiar with Wellhead Protection initiatives and upcoming events. Each SWAP Plan includes four major components. They are Delineation, Education, Pollution Identification, and Emergency Response. Delineation is a process that identifies the location of the aquifer. The aquifer is the area of sand and gravel that hold the drinking water. The second part is education which also includes outreach. In this section of the SWAP Plan, programs are developed that communicate with the public. The goal of this communication is to protection our drinking water. 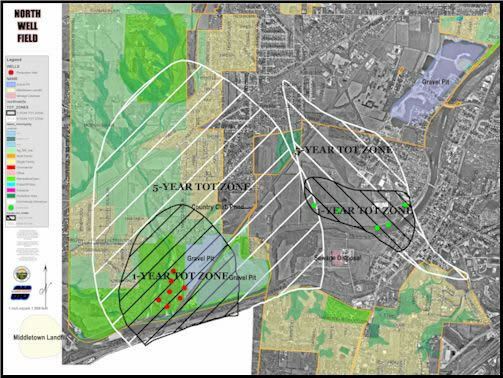 This is accomplished by showing the area that must be protected and preventing pollution. Pollution Identification is surveying the protection area to target activities that could containment the drinking water. These activities many be related to the home or business. Once the list of possible pollution is complete, then strategies can be implemented that will eliminate or greatly reduce any contamination to the drinking water. The final component of the SWAP Plan is Emergency Response. 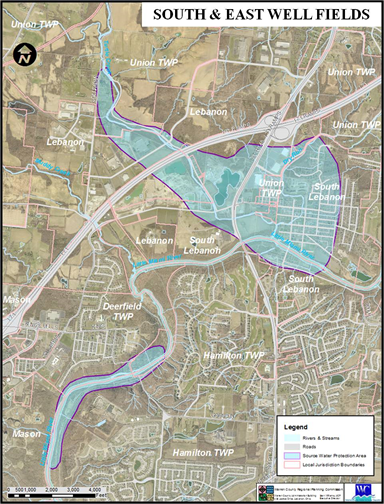 This Emergency Response demonstrates how the community will deal with a pollution issue plus identifies where additional sources of drinking water can be secured. At this time, Warren County operates three production well fields that supply drinking water. They are referred to as the North, South, and East. The North Well Field supplies water for the County’s Franklin Area Public Water System. The South and East Well Fields supply water for the Richard A. Renneker Public Water System. All of the well fields have SWAP Plans that are endorsed by the Ohio Environmental Protection Agency. The maps showing the areas that must be protection are located below.